Cold Start: Build a serverless Slack app with nanoservices! This week we started building Slack apps using serverless nanoservices. Interested in building your own? Read on! 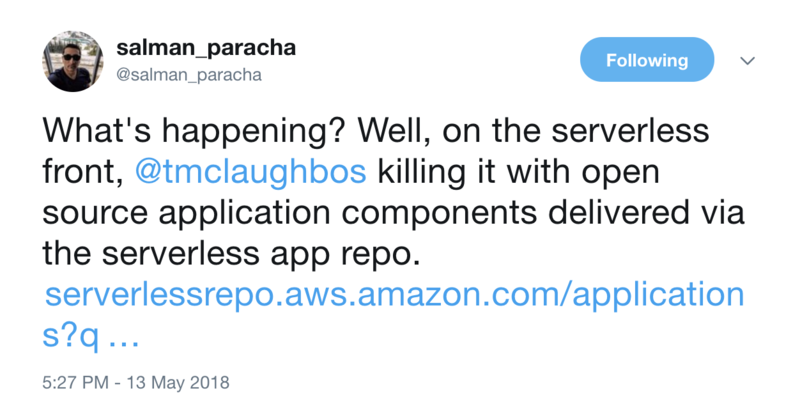 We spent this week building several serverless nanoservices and publishing them to AWS Serverless Application Repository (SAR). Let's get on with what we built last week! This week we started building a small project to get AWS Health notifications delivered to a Slack channel of ours. Realizing how useful publishing more data sources to Slack would be, we applied a nanoservice approach to solving the problem. We first constructed an application to deliver AWS Health notification messages to one of our Slack channels. (We still don't have region and global health status but this is a start.) Next, we reused James Hood's Twitter event source to construct another application to deliver #AWSWishlist tweets to our Slack so we can keep up with what users want. What makes a nanoservice different? It's code and infrastructure, that can be versioned, and can be combined with other nanoservices to build applications. The Twitter event source was originally used to build a web application and we used it to instead build a Slack app. We think this reuse of code and infrastructure similar in a manner more like a library is pretty novel and one of the innovations serverless will unlock. Does this sound interesting to you? Feel like building your own Slack app? Do it and tweet using the hashtag #ServerlessSlackApp to show it off! The Goat Farm podcast caught up with three of us at DevOpsDays Seattle to discuss DevOps in a Cloud Native and Serverless world. Hear from Joe Beda of Heptio, Rob Cummings of Slalom Consulting, and myself. If you're also interested in DevOps in the enterprise, subscribe to The Goat Farm podcast. What is S3 Select and how do you use it? AWS is always coming up with new and interesting ways to use S3 and that's why we love it. Jeremy Daly delivers another great blog post. This time, how do you manage multiple different environments in your Serverless Framework serverless.yml? Jeremy shows the exact pattern we use as well.